The Curvation gas stove have an extremely high efficiency, testing up to 83%. 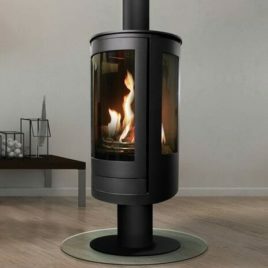 The technology gives you a superior depth and height of flame, plus the Eco-Flame feature allows the flame to alternate from the back to the front, giving a dancing depth of flame that uses 50% less gas. 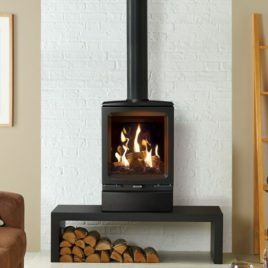 The compact Gazco Huntingdon 20 gas stove’s proportions make it perfect for British fireplace openings, whilst its highly efficient 2.6kW heat output easily creates a warming atmosphere in standard sized rooms. 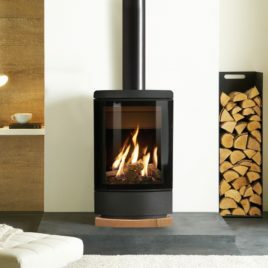 Producing dancing flames over a realistic log fuel bed, this stove is offered with Standard and Programmable Thermostatic remote controls, providing real fire ambience at the touch of a button. Presented in either Matt Black, Matt Ivory or Ivory enamel finishes, the Huntingdon 20 lets you choose a colour that best suits your home. 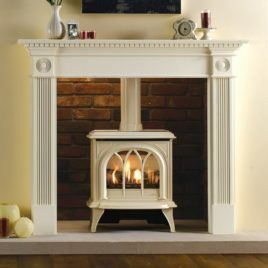 Further expanding the styling options available, this elegant stove is also offered in both clear door and tracery versions. 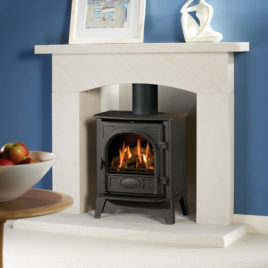 The Huntington 30 places itself very neatly into a traditional set up with its defining detail and slight curves. The tracery doors are an optional feature to the stove. Like all Gas Stoves the heating appliance is sealed meaning you have optimum heat performance and what’s best, unlike solid fuel stoves, no glass marks. Regular maintenance once every 12 months is recommended. 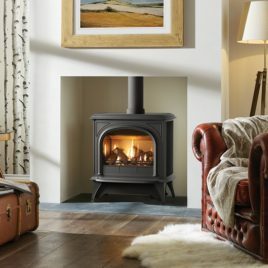 The largest model in the Gazco Huntingdon range, the Gas Huntingdon 40 gas stove is perfectly at home in big open fireplaces or spacious interiors. With a powerful heat output of 5kW, it can quickly create a warming atmosphere whilst still maintaining an exceptional efficiency up to 84%, thanks to its cutting edge gas stove technology. 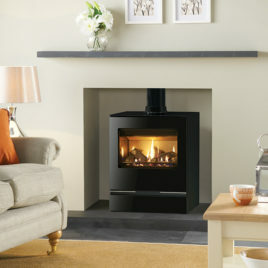 Presented in a three finishes; Matt Black, Matt Ivory and Ivory enamel, the Huntingdon 40 gas stove can be chosen with a tracery door for refined style or clear door for an uninterrupted view of the realistic log bed and rolling flames, allowing you to select the styling that fits your décor. All the heat and authenticity of real flames at the flick of a switch and little to no maintenance. Like what you see? Have a look at what material your Hearth could be. Don't have a Conventional (Class 1 or 2) Flue? NO PROBLEM! Check out this link to explore how Balanced Flue may be able to help you. If you'd like to find out more or you're unsure how or where to start; please Contact Us (We do free surveys & quotations!). Country or city, traditional or contemporary, the innovative Gazco Marlborough gas stove has the flexibility to suit your lifestyle and your decor. 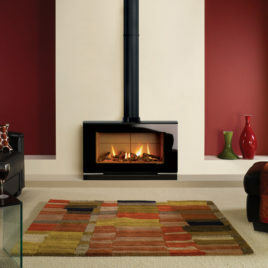 It is available in three sizes and each has an extensive window area to allow you to enjoy the dancing flames and warm ambience of the coal or log-effect gas fires to the full. Operation is simplicity itself too. There’s Piezo ignition and a manual control to adjust the flame height and heat output. Choose Gazco’s Command upgreadable remote control and you can adjust the flames and heat from your armchair. Alternatively, opt for the deluxe Programmable upgradeable remote control to set the gas stove to switch itself on and off and heat the room to the temperature you select. 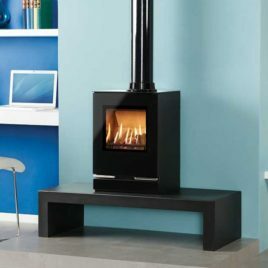 Offered in a stylish Graphite steel front, the Gazco F670 Steel gas stove is an attractive alternative to the Glass model and shares all the same firebox technology and lining options. These innovative gas stoves are capable of producing up to 5.60kW of heat, with an outstanding 82% efficiency, all with easy and convenient operation thanks to the Programmable Thermostatic handset featuring timer and thermostatic temperature controls. The Stockton 5 places itself very neatly into a traditional set up with its minimal detail and slight curves. Like all Gas Stoves the heating appliance is sealed meaning you have optimum heat performance and what’s best, unlike solid fuel stoves, no glass marks. Regular maintenance once every 12 months is recommended. 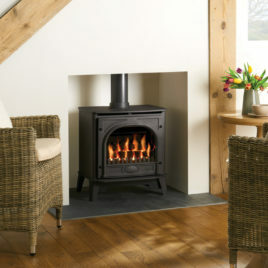 The Stockton 5 is also available in a woodburning/multifuel version or an electric version. 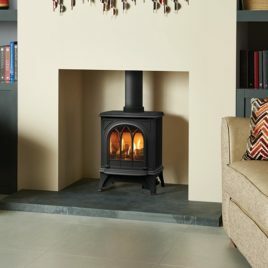 The Gazco Stockton Medium gas stove feature a cast iron door and uses a heavy gauge steel for the body, Stockton gas stoves combine all the traditional elements of a wood burning stove with the modern convenience of gas. This means you can enjoy an unrivalled coal or log-effect fire together with a heating performance that will warm your room on those cold winter evenings. In fact, you won’t even have to move from your chair if you opt for one of Gazco’s upgradeable remote controls. 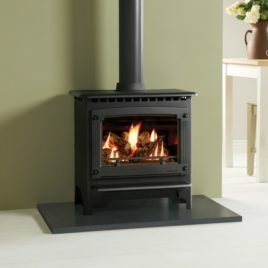 The Gazco Stockton Small gas stove feature a cast iron door and uses a heavy gauge steel for the body, Stockton gas stoves combine all the traditional elements of a wood burning stove with the modern convenience of gas. This means you can enjoy an unrivalled coal or log-effect fire together with a heating performance that will warm your room on those cold winter evenings. In fact, you won’t even have to move from your chair if you opt for one of Gazco’s upgradeable remote controls. 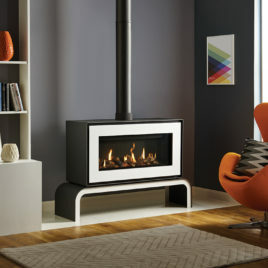 Offering a breathtaking view of the rolling flames, the Studio 1 Freestanding gas fire and the Studio 2 Freestanding gas fire shown incorporate the same high efficiency firebox technology as their Studio inset equivalents, as well as the wide range of Studio fuel bed and firebox lining options. These large format fires are available with a choice of smoothly curving bench or plinth mounting options, each echoing the fire’s distinctive design and are offered in either White or Black finishes. Sharing all the features of the Studio 1 Freestanding gas fire the larger Studio 2 displays a spectacular, panoramic flame picture and can provide a controllable heat output of up to 7.0kW, ideal for warming more spacious rooms. Exuding presence, this stunning gas fire is offered in both White and Black steel fronts along with your choice of plinth or bench, and can achieve a designer statement wherever it is installed. The Riva Large places itself modestly into a modern set up with its clean lines and simplistic design. Like all Gas Stoves the heating appliance is sealed meaning you have optimum heat performance and what’s best, unlike solid fuel stoves, no glass marks. Regular maintenance once every 12 months is recommended. The Riva Medium places itself modestly into a modern set up with its clean lines and simplistic design. 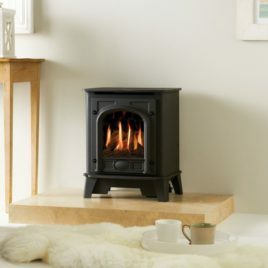 Like all Gas Stoves the heating appliance is sealed meaning you have optimum heat performance and what’s best, unlike solid fuel stoves, no glass marks. Regular maintenance once every 12 months is recommended. 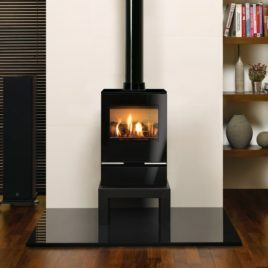 Sporting an eye-catching glass-fronted door and integral glass plinth, the Gazco Vision Midi gas stove emits a heat output of up to 3.44kW and is a highly efficient model. Featuring our latest highly-realistic log effect fire, this contemporary gas stove can be controlled from ignition to extinguish, all from the comfort of your sofa using one of Gazco’s upgradeable remote controls: Standard or Programmable Thermsotatic. 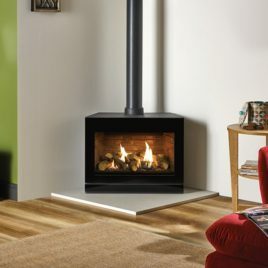 The Gazco Vision Small gas stove offers beautiful, contemporary aesthetics in a neat package – well suited to standard chimney openings thanks to its compact proportions. 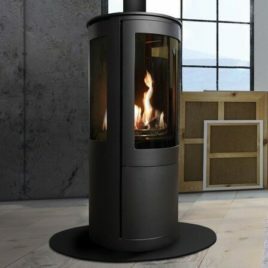 Providing a highly efficient heat output of up to 2.62kW, this cutting edge gas stove is available in either conventional or balanced flue versions for flexible installation options. 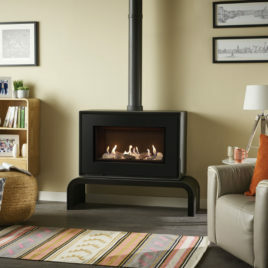 The Vision Small comes with manual controls as standard, but can be upgraded with remote control options including Programmable Thermostatic handset, allowing the stove to be preset to turn on at certain times or ambient temperatures. Elegantly styled to fit equally well in either contemporary or traditional settings alike, the Gazco Vogue Midi gas stoves feature a cast iron door and top plate with refined curves and bevelled edges. For increased presence, Midline models are mounted on a matching log store base that can be used to house chopped logs to add to the woodburning aesthetic. 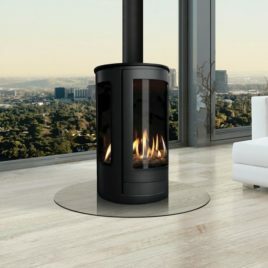 Creating breathtaking flame visuals, Vogue Gas stoves feature a highly realistic log bed and a polished black glass lining that provides a stunning, multi-sided reflection of the flames. Designed with the very latest gas fire technology, these cutting edge stoves provide an ample 4.4kW of heat at 80% efficiency. For greater convenience, these stylish stoves can be upgraded with a programmable thermostatic handset which allows you to pre-set the stove to provide heat at certain times or temperatures. The Vogue Midi stove is also available in a wood burning version.